I've tried the fried spring rolls, now it's time for the healthier fresh ones! The fun thing about these is you don't necessarily have any cooking to do! This is a great vegetarian dish or with seafood or chicken. If you want vegetarian you could use tofu or just a your favourite vegetables. I've made with prawns and chicken, but in this photo I've used only chicken. It's a great dish for leftover chicken. I happen to have some cooked chicken from the deli which worked great for a speedy light meal before we went to the cinema. We had 2 each and it actually filled us up quite well. Traditionally, however, this would be a starter. I didn't measure my ingredients, I judged by eye, so the following measurements are just a guideline. Enjoy the taste of health! I loved the recipes and shall for sure try at home. However,these spring rolls looks great but I adore the combination with the peanut sauce with your own personal taste-bud choice! 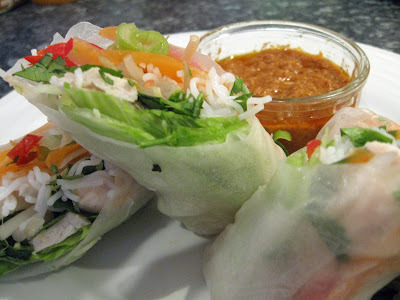 I have added you blog in my food blog-roll list. Seems, I shall be one of the frequent reader of your blog. Keep cooking healthy and updating! Your blog is looking absolutely delicious (I can almost taste your dishes from the computer screen). Great ideas, super combinations, and terrific improv- I'm impressed! Keep up the vege health concious foods, love the asian touch... And wow, good to see that Canadian food exists!